Lemon chicken soup, coming right up! This is the best way to come out of the winter funk. You know, the January and February winter funk when the holidays are over, but it’s still super chilly outside and just… generally gray and gloomy? We’re breaking out of that with a fabulous, warming lemon chicken soup that will take you minutes to make. 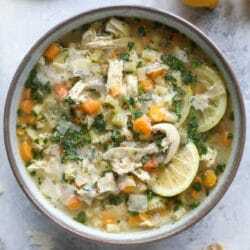 This lemon chicken soup is one of the EASIEST soups I have ever made. Ever ever! And it’s super packed with flavor thanks to the Kitchen Basics Turmeric and Ginger Chicken Bone Broth that I added to the stock. This stuff is like liquid gold. Oh my gosh – guys, we are LOV.ING. it. It is so super flavorful. I know that bone broth is really trendy right now and that people even sip on a warm cup of it morning, noon and night (Eddie just about died when I suggested that) and while I don’t have much desire to drink it on its own, I love using it in recipes. It adds an extra boost of oomph. Especially this one! First, the flavor. Holy flavor bomb. This little carton of chicken bone broth has turmeric, ginger and lemongrass. I ADORE all of those flavors and even used some of this in my chicken and dumplings recipe the other night. It’s so, so good. Next up – I’m putting it in some homemade ramen. For sure. Second, the protein. This carton has TEN grams of protein, so obviously that was how I sold Eddie on sipping it. Of course. The minute he saw that, he was in. And when I saw it, I was super impressed and shocked. Let’s just talk about how quick and delicious this soup is. I made the soup with leftover shredded chicken that I had from roasting a whole one last Sunday night. But in a pinch, I would just use shredded rotisserie chicken. You can grab one on the way home from work and have this made in about 30 minutes. Or you can use any sort of leftover chicken you might have from other recipes during the week! Make is simple. To keep things semi-traditional, I used a sweet onion, carrot and celery. YES. We all know that I think celery is the worst, but I can handle it in soups and stews. That is it. Otherwise, peace out celery. Also, some ginger and garlic for ZING. But! I added in some fresh lemon zest with the veggies while they were softening in the butter too. The chicken, stock and bone broth went in next with an entire sliced lemon for even more lemony flavor. Then! Comes the pasta. This isn’t a necessary step, but one I took to bulk it up for us a bit. And because the soup without pasta would leave Eddie ravenous after, like, 13 minutes. Ditalini was my pasta of choice, mostly because it’s adorable, but also because it’s simple. It cooks quickly since it’s a small cut of pasta AND Max loves it and can easily grab it with a spoon since it’s tiny. I love a hearty spoonful of soup. On top, I love tons (like, TONS!) of fresh herbs and shaved parmesan cheese. Then lots of crackers or bread for dipping. Can’t go without that. Words can’t even express how much I adore this. It’s warming and comforting and soothing and weirdly enough, a bit refreshing! It’s like a hot hug in a bowl with a slight hint of Spring. Which we soooo need right now. Am I right? Heat a large pot over medium-low heat and add the olive oil and butter. Once melted, add in the onion, carrots, celery, garlic, ginger, salt and pepper. Stir and cook until the vegetables are slightly softened, about 5 minutes. Stir in the lemon zest and chicken. Add in the lemon slices, chicken stock, bone brother and water. Bring the mixture to a boil. Once boiling, add the pasta and reduce to a simmer. Cook until the pasta is al dente, about 8 to 10 minutes. Stir in the herbs and the chives. Serve immediately with shaved parmesan and a lemon wedge! Ooooh and that melty cheese on top. Oh how I want a bowl of this right now!! Ohh this soup looks perfect! I’ll have to look for that broth. This is just what I need, with my flu! It looks so comforting. i hope you feel better alexis! Looks like the perfect bowl of sunshine to cure the winter blues. Kitchen Basics is the only stock I use, can’t wait to try their bone broth. How do you think your dumplings would work in this instead of the pasta? omg that is a GREAT idea!!! i think they would work great in here! This looks so warm and cozy!! I made this for dinner and it is amazing! so glad you liked it janie! Where do you find the bone broth? A regular grocery store? I just made this tonight and it was delicious! I couldn’t find the turmeric ginger bone broth though… so I just used the original and seasoned my chicken with turmeric and added a bit more ginger to the soup. So good! Thinking about making this for dinner tonight. Do you get any bitterness from the lemon rind? This was amazing! I love lemon, but I wasn’t sure how it would be in a soup. It was subtle and refreshing! My two year old ate it up as well! Already looking forward to making it again. I have been wanting to make this since you posted it, Jessica, and I finally made it last night. I am not exaggerating when I say it’s the best soup I’ve made in my “culinary career”! ;-) So, so good. Thank you for sharing this recipe on your blog, although I think you should have included it in your The Pretty Dish as it’s a really “pretty” soup, too! It’s amazing how much the lemon zest and lemon slices add to the overall flavor. Thank you again! I will definitely be keeping this recipe! I made this soup today and we ate it this evening with a nice crusty french baguette. This is a keeper. Hubby and I loved it! Loved the lemony/ ginger flavors. We also loved the finish of shaved parmesan and chives. Perfect! Couldn’t find the bone broth specified so added turmeric and ginger to a standard one. I thought the two cups water would be excessive but turned out just right. We have plenty for two days of leftovers, served best with a thick piece of buttered sourdough. This soup is incredible! Love love love! I had it at a friend’s house and knew I needed the recipe. Fabulous lemon flavor in it – such a comforting soup! I love this simple and easy recipe will definitely use it! This soup was great! I will definitely be making it again. I just made this and it’s amazing! Thank you for the wonderful recipe! This soup is delicious! I left out the pasta and added cannellini beans. I did not add the additional water the recipe calls for. All of your recipes turn out great! Thanks for another winner! Made this soup for the 2nd time tonight with a few changes. I used a combination of low sodium chicken broth (48 oz) and vegetable broth (32 oz), added 2 small diced zucchini, 1 lg. diced red pepper, and 1 can petite diced tomatoes. I used fresh mini tortellinis for the pasta (family sized bag). Also omitted ginger ( my daughter dislikes it). It came out fantastic! My husband also said it’s his favorite soup now. Thanks for the recipe! The lemon really makes it extra special. Everyone loved It! Delicious. I had to adapt to the ingredients that were available. My store didn’t have turmeric ginger bone broth. So I used regular bone broth. They didn’t have fresh turmeric either. So I used fresh ginger (should have used more) and dried turmeric. The recipe is really good! I used feta and cilantro to garnish. Healthy and yum!